A new year has begun; numerous other things going on in my life at the moment, as well as a lack of interesting releases, left me visiting the cinema a lot less throughout 2018 compared to previous years, and consequently I found myself struggling to find enough material to compose the usual list of my most hated films before moving on to the most beloved. So, we'll dismiss the need to rank any stinkers, and focus solely on the positives; allow me to present my favourite five films of 2018. Gargantuan bests at the box office were put in place by the ever growing MCU in 2018, with Black Panther setting domestic records and, as was pretty much expected from the get go, Avengers: Infinity War setting remarkable worldwide records not too long after release. 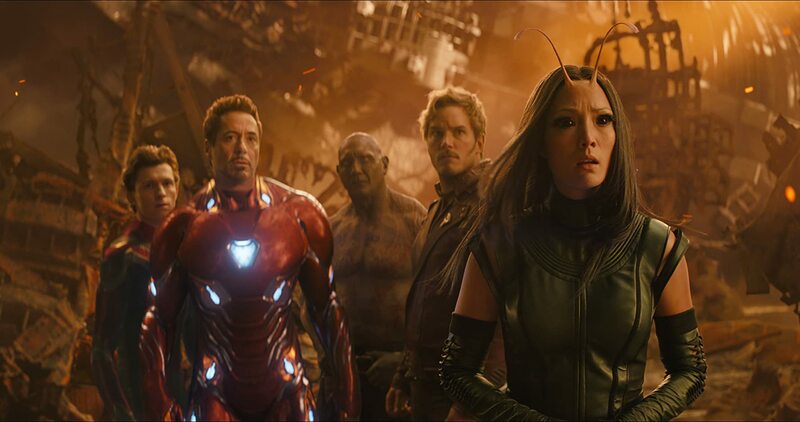 With over $2 billion in global earnings, Infinity War was yet another moneymaking machine in the film industry's largest franchise; my thoughts on said franchise have grown more positive in recent times after a fair few disappointments in the past, and I agree with many that Infinity War was arguably one of the best instalments to grace the series in a long while. With a truck sized budget, stunning visual effects are to be expected, and it of course doesn't disappointment; thus, we are treated to all sorts of gripping action sequences from start to finish. But we also have a strong story to carry things along, and a notably powerful ending that leaves us eager for the next installment. What nicely supports all this gripping action and surprisingly complex storytelling is of course its incredibly ensemble cast, bringing together countless talent from the biggest MCU hits, all of whom give some of their best performances within the franchise this time round, it has to be said; largely blending humour and genuine emotion effectively. I've previously maintained thoughts that this series should retire fairly soon, but after Infinity War, I'm certainly left keen to see more. Widespread acclaim greeted Into the Spider-Verse upon release, many even branding it the best film the web head has ever appeared in; and to be fair, this praise isn't undeserved. Into the Spider-Verse is a charming and spirited adventure that brings together various incarnations of the eponymous hero into a story that balances humour and genuine emotion in an effective manner. What of course stands out at first glance is the film's unique visuals, combining traditional and computer animation to create a stylised comic book aesthetic, and one that's incredibly delightful to look at throughout. The film boasts a likeable cast of characters, focusing primarily on protagonist Miles Morales and the main incarnation of Spider-Man, with the various others coming into play further into the story. Everything is nicely balanced and well structured, easy to follow yet full of depth, and performed with some superb vocal work from the incredibly talented cast. For sure, this is one of the finest animated films I've seen in recent times. Deadpool set remarkably high standards in an admittedly small R rated superhero genre, so much so that a sequel would need a lot of care and attention put into it to seem like more than just a lame cash grab; thankfully, the end result is far from that, and in some cases even a superior effort. Ryan Reynolds will arguably stand out as one of the film's finest merits, delivering a performance just as funny and stylish as before; the same can be said for the strong supporting cast, namely newcomer Josh Brolin. It's even better when said performances are over a well drafted script, full of witty and smart humour, but also a surprisingly clever narrative that embraces self parody in a unique way and, as is expected from any modern superhero flick, boasts a number of gripping set pieces, brought to life on screen with forever impressive visuals and superb action choreography. Deadpool 2 is of course not for the younger superhero fans, but it certainly remains a great watch through and through. A Quiet Place stands out as that rare superb horror film that blesses cinema every so often, earning this accolade thanks to its ability to deliver genuine scares and tension, but also thanks to its incredibly engaging storyline that keeps audiences hooked for reasons outside of waiting to be freaked out. Whilst the film doesn't outright dive into the history behind its concept of a world where humanity is on the verge of extinction, it slowly and cleverly unveils it via subtle methods throughout, leaving us keen to see more whilst being haunted by a number of chilling sequences involving the sinister beings responsible for all this destruction. 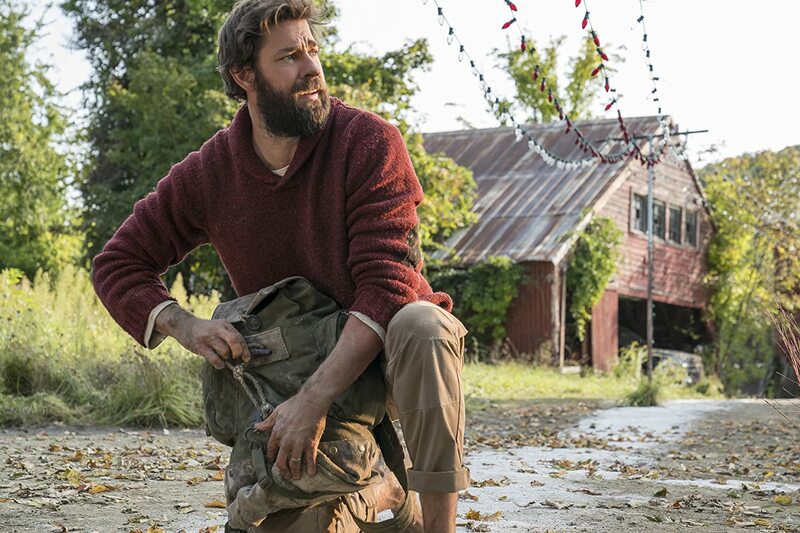 The film's method of storytelling will seem frustratingly vague to some as it will clever to others, but either way, A Quiet Place is definitely a winner when it comes to a struggling genre. It has its fair share of jump scares, but they're more than just cheap ways to make you wet yourself, with genuinely haunting events unfolding on screen that definitely leave lasting impressions. It's this coupled with an uneasy atmosphere throughout, as well as some fantastic performances and visual design, that makes it one of the best horror films I've certainly seen in a long, long time. 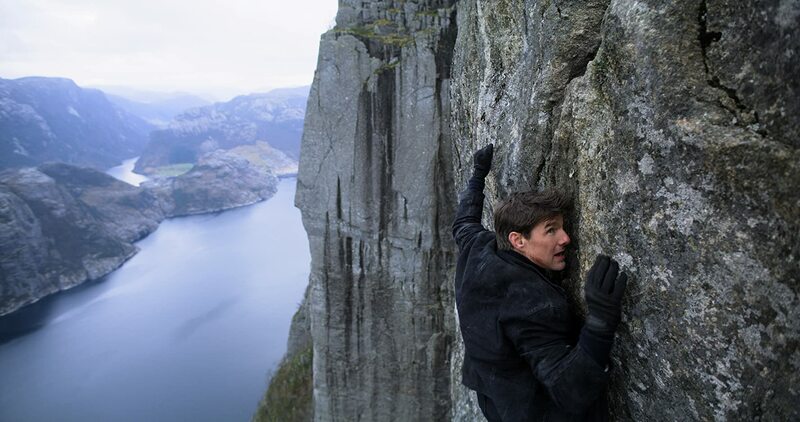 The Mission: Impossible series continues its resurgence of critical acclaim and box office success with Fallout, and when it comes to such acclaim, I was certainly amongst that general consensus. Fallout now stands as my favourite of the series; a series that now seems to get better and better with each new installment. This latest entry delivers once again some of the best set pieces in a modern action film, all beautifully structured throughout; but this is much more than a case of flicking through countless set pieces, with a thin story placed on the back burner to thread them together. No, this is a story that is once again well thought out and extremely compelling, full of engaging twists and brought to life by the efforts of a superb cast, primarily (and obviously) Cruise himself and Henry Cavill as our key antagonist. As I've said, each new instalment of this series now manages to top the last, and Fallout continues this trend; it's clever, exciting, and superbly acted, and certainly the film I enjoyed the most this year. UPDATE: This post has now been adapted into a video for the gaming channel ProjectFalconPunch, featuring Dan Thomas! Check it out here!